এই টিউটোরিয়াল ব্লগটি লিখার সময় প্রথমে যেটা আসে -"কোথা থেকে শুরু করব?" একেবারে প্রথম থেকে আরম্ভ করলে কেমন হয়? Its better to start with (Try ubuntu without any change in your computer). 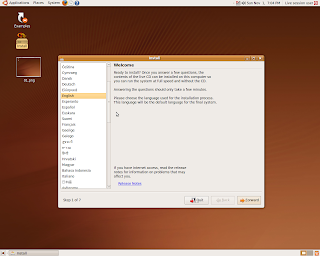 Click it to boot ubuntu live from CD. It will take a few moment. You can try out ubuntu from here. Many programs you use will be there by default. 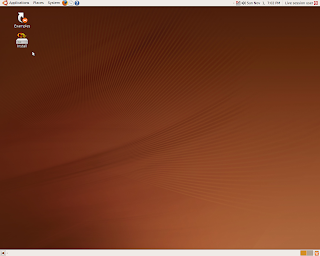 To install ubuntu click on the icon showed in the desktop. Select the language you prefer and press forward. Select your region. Just click where you live on the world map (if you are using running CD) or select from drop down list. Press forward. Here you can select your Keyboard layout if you want. Just click forward if you want default. This is the most important part. If you want ubuntu as a second choice beside any other OS select specify partitions manually and click forward. If you dont have enough space under 'free space' heading then delete a few partition where you dont have important data. To delete a partition select that partition and click delete. হয়ে গেলে Forward চাপুন, সেটিং Import এর window আসলে Forward চাপুন। ব্যাস!! .. .. এবার শুধু অপেক্ষা .. .. .. .. !! Just click 'forward' - 'forward' to continue...Sit back and wait.